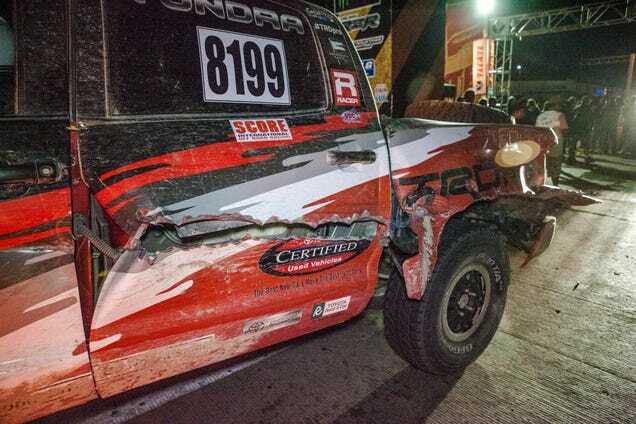 A 2014 Toyota Tundra TRD Pro finished 69th overall out of 131 finishers at this year’s Baja 1000, rolling across the finish line with a gnarly bit of battle damage in under 36 hours. That’s not half bad for a factory-tuned truck, in a race where just passing the last flag is considered a feat. 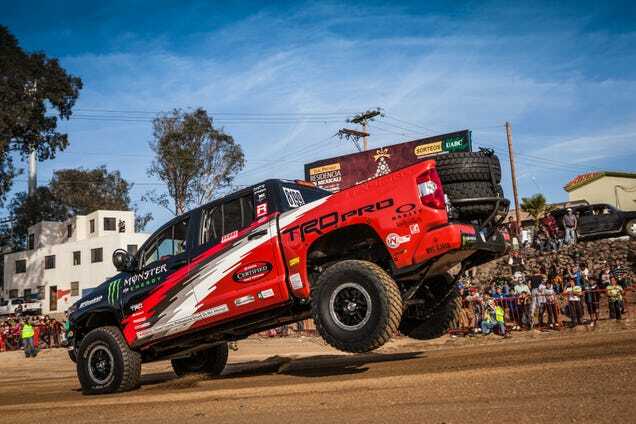 Any four-wheeled vehicle competing in the Baja requires a fair bit of safety gear and such; so the Full Stock Tundra doesn’t really look “stock” per se… but Toyota assures us there’s nothing more than a factory-fresh Tundra TRD Pro under that roll cage. The Tundra actually finished first in its Full Stock class, which you better believe they’re going to be bragging about their next bout of commercials. You don’t really need to be too impressed with that though; there were only three other competitors and none of them were with factory teams coached by off-road racing legend Ivan “Ironman” Stewart. 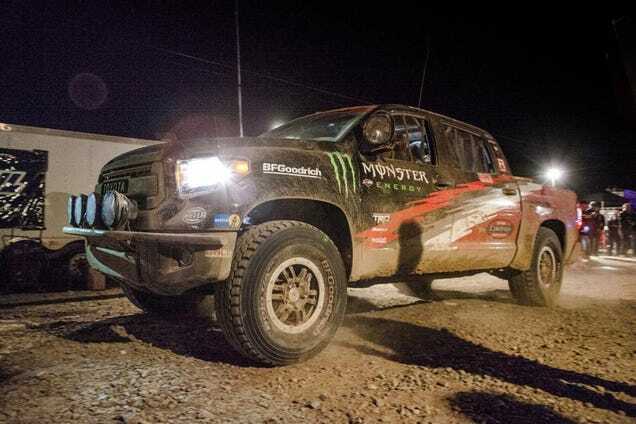 With Andy Bell leading the driving effort, that Tundra finished the 2014 Baja 1000 in 35 hours 40 minutes, 13 hours, 9 minutes behind overall race winner Rob MacCachern and his Rockstar Energy trophy truck. For a little more perspective; Toyota did the race at an average of 36.105 MPH. MacCachern was cooking along at a 56.644 MPH average, finishing in just over 22 hours, 31 minutes. The Full Stock competitive field was another Toyota (36 hours, 30 minutes), a Ford (49 hours, 36 minutes) and a Hummer than didn’t finish. Toyota some pictures of battle scars in the side of the truck, but no explanation as to what happened or how much it hampered their time. Will update when they return my call about it. 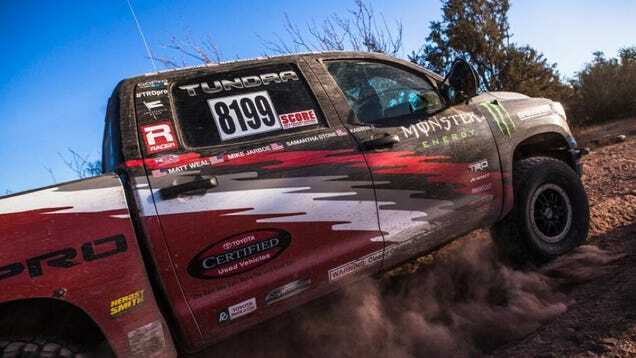 The Tundra TRD Pro’s 69th out of 131 finishers (and pages and pages of DNFs) is a solid effort. So be real with me now, Toyota fans, truck buyers, and everybody else… does this race effort make you any more interested in Toyota Trucks, or the TRD Pro off-road lineup?